For enthusiasts of 3-D printing and its many possibilities, a man like Berokh Khoshnevis needs no introduction. As for the rest of us, he is the USC’s Director of Manufacturing Engineering, and has spent the last decade working on a new direction for this emerging technology. Back in 2012, he gave a lecture at TEDxTalks where he proposed that automated printing and custom software could revolutionize construction as we know it. Intrinsic to this vision are a number of technologies that have emerged in recent years. These include Computer-Assisted Design/Computer-Assisted Manufacturing (CAD/CAM), robotics, and “contour crafting” (i.e. automated construction). 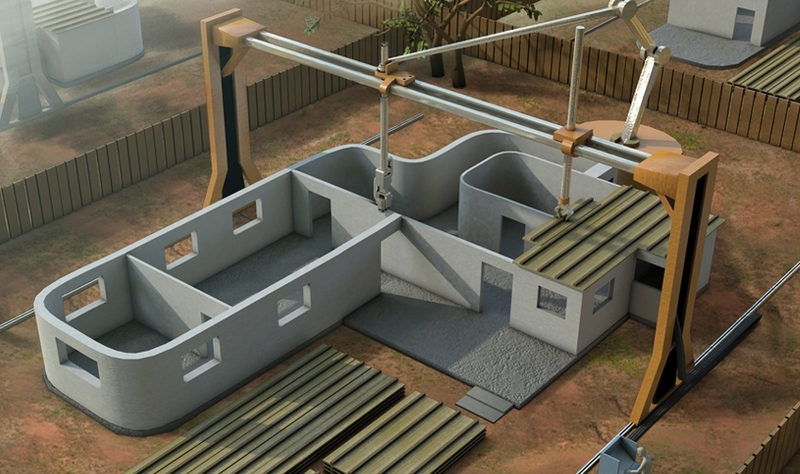 By combining design software with a large, crane-sized 3-D printing machine, Khoshnevis proposes a process where homes can be built in just 20 hours. Khoshnevis started working on the idea when he realized the gigantic opportunity in introducing more speed and affordability into construction. All of the technology was already in place, all that was required was to custom make the hardware and software to carry it all out. Since that time, he and his staff have worked tirelessly to perfect the process and vary up the materials used. Working through USC’s Center for Rapid Automated Fabrication Technologies, Khoshnevis and his students have made major progress with their designs and prototypes. 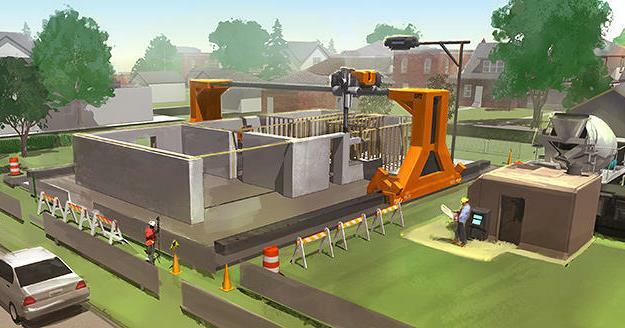 His robotic construction system has now printed entire six-foot tall sections of homes in his lab, using concrete, gypsum, wood chips, and epoxy, to create layered walls sections of floor. The system uses robotic arms and extrusion nozzles that are controlled by a computerized gantry system which moves a nozzle back and forth. Cement, or other desired materials, are placed down layer by layer to form different sections of the structure. Though the range of applications are currently limited to things like emergency and temporary shelters, Khoshnevis thinks it will someday be able to build a 2,500-square-foot home in 20 hours. It’s the last frontier of automation. Everything else is made by machines except buildings. Your shoes, your car, your appliances. You don’t have to buy anything that is made by hand. As Khoshnevis explained during his 2012 lecture at TEDx, the greatest intended market for this technology is housing construction in the developing world. In such places of the world, this low-cost method of creating housing could lead to the elimination of slums as well as all the unhealthy conditions and socioeconomic baggage that comes with them. But in the developed world, he also envisions how contour crafting machines could allow homes to be built more cheaply by reducing labor and material costs. As he pointed out in his lecture, construction is one of the most inefficient, dirty and dangerous industries there is, more so than even mining and oil drilling. Given a method that wastes far less material and uses less energy, this would reduce our impact on the natural environment. But of course, what would this all be without some serious, science fiction-like applications? 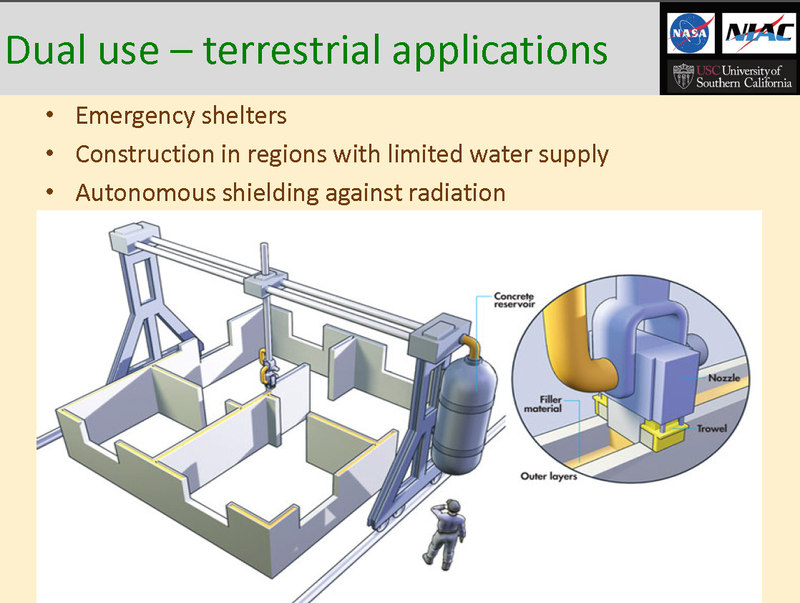 For some time now, NASA and the ESA has been looking at additive manufacturing and robotics to create extra-terrestrial settlement. 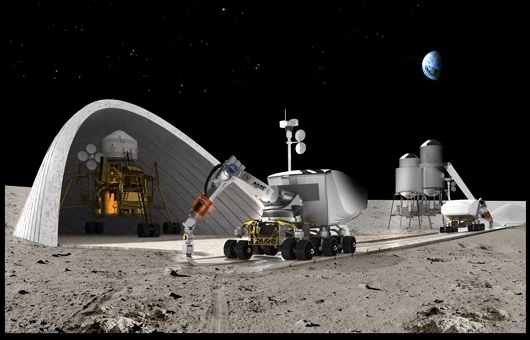 Looking farther afield, NASA has given Khoshnevis a grant to work on building lunar structures on the moon or other planets that humans could one day colonize. 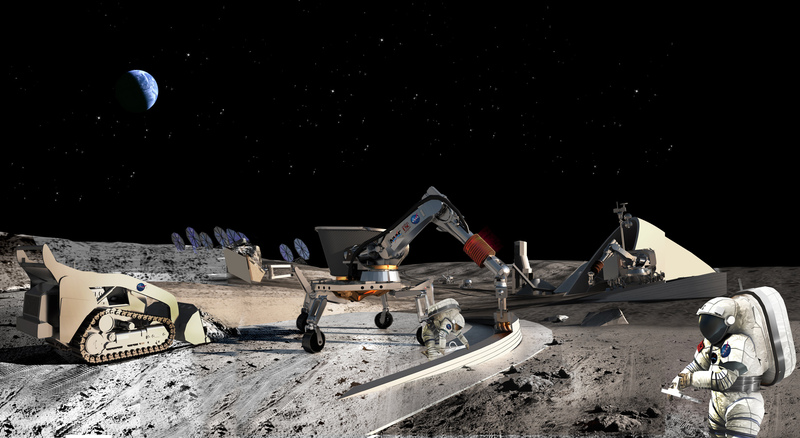 Many existing technologies would also be employed, such as the Lunar Electric Rover, the unpressurized Chariot rover, the versatile light-weight crane and Tri-Athlete cargo transporter as well some new concepts that are currently in testing. These include some habitat mockups and new generations of spacesuits that are currently undergoing tests at NASA’s Desert Research And Technological Studies (D-RATS). Many of the details of this arrangement are shrouded in secrecy, but I think I can imagine what would be involved. Basically, the current research and development paradigm is focusing on combining additive manufacturing and sintering technology, using microwaves to turn powder into molten material, which then hardens as it is printed out. 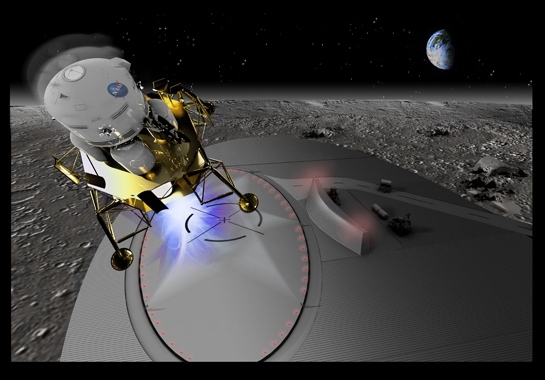 To give you an idea of what they would look like, picture a crane-like robot taking in Moon regolith or Martian dust, bombarding it with microwaves to create a hot glue-like material, and then printing it out, layer by layer, to create contoured modules as hard as ceramic. 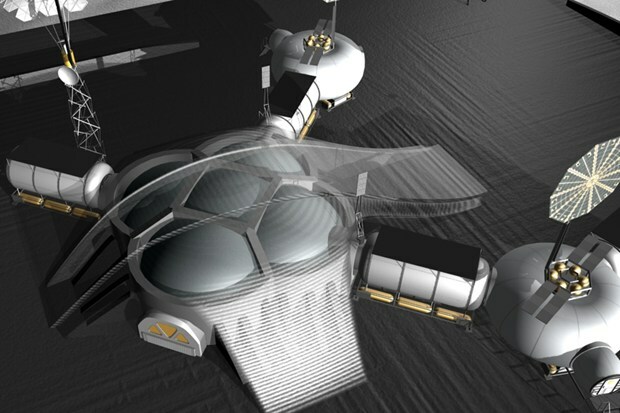 These modules, once complete, would be pressurized and have multiple sections – for research, storage, recreation, and whatever else the colonists plan on getting up to. Reminds me a little bit of the nano forges in Joe Haldeman´s novel “the forever peace” given the right raw materials they can make virtually anything.